Elvis Presley's guitars were a major component of the iconic rock and roll image created by Elvis Presley that revolutionized popular culture in the 1950s and 1960s. It is impossible to gauge the impact of that image on millions of young people around the world who were inspired to learn to play guitar after watching Presley in performance, on television, or in films. Although not known for his abilities as a guitarist, Presley had a profound musical influence on some of the most important rock and roll artists to emerge since the 1950s, including Buddy Holly, John Lennon, Paul McCartney, George Harrison, Bob Dylan, and Bruce Springsteen. The extent of Presley's impact on their lives and music is captured in John Lennon's famous quote: "Before Elvis, there was nothing." According to his first lead guitarist, Scotty Moore, Presley was not "an accomplished musician", yet he possessed "an uncanny and amazing sense of timing and rhythm." In the early years of his career, Presley's rhythm guitar accompaniment played a major role in the sound of his early performances and recordings. Moore noted that as Presley began to learn to move on stage and to work the audience with his physical performance, his guitar became more of a "prop". Presley was not known to treat his instruments in a gentle manner. His very aggressive strumming style would frequently break strings during his performances. The lack of a microphone on his guitar throughout those years contributed to the development of his "aggressive style in attempt to be heard". As his career progressed, he became even more aggressive toward his instruments, frequently tossing his guitar to Charlie Hodge, who sometimes failed to catch it. The impact of the large belt buckles and jewelry he wore left their marks on most of his instruments. The following is a list of guitars that Presley owned or used for his performances and recordings. 1940s Kay (Tupelo Hardware) January 1946 – August 1954 This was Presley's first guitar, purchased at Tupelo Hardware Co. for $7.75 (US$94 in 2016 dollars) on his eleventh birthday, January 8, 1946. He used it throughout his high school years and on his first Sun recording sessions. 1939 Recording King 1954 Purchased at Montgomery Ward in Memphis. The guitar was given to Hall of Fame harness horseman Delvin G. Miller May 28, 1964 and includes a typed and signed note from Elvis to Miller which he affixed to the inside of the instrument. It is now in a private collection. 1963 Gibson Super 400 62713 June 1968 Borrowed from Scotty Moore for the live segments of the Elvis 1968 Comeback Special, purchased from Gibson in October 1963 for $237 (US$1,835 in 2016 dollars). July 1975 Given to audience member Mike Harris during a concert on July 24, 1975 in Asheville, North Carolina, saying, "This is yours. Hold on to that. Hopefully, it'll be valuable one day." The following is a list of "prop" guitars that Presley used on screen during musical numbers in his 31 theatrical films. These guitars were purchased by the studios, and in some cases, were identical to Presley's own performance guitars. The Gibson J-200 used in Loving You, King Creole, and G.I. Blues, for example, was identical to the Gibson J-200 he purchased in October 1956 (serial number A-22937). ↑ The guitar, as well as a gold-plated Walther PPK handgun, was given to Hawaii Five-O star Jack Lord backstage during Elvis's 1973 engagement at the Las Vegas Hilton. 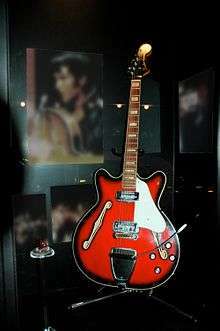 The instrument was later acquired from the estate of Jack Lord, and includes a letter from Joe Esposito, who retrieved the unique guitar from Graceland. ↑ Soon after purchasing the 1955 Martin D-28, Presley received a custom-made tooled leather cover with his name across the front, made by Marcus Van Story in the basement of O.K. Houck Piano Co. where he worked occasionally repairing pianos. Presley admired a similar one used by Hank Snow. One of the most famous photos of Presley's 1955 Martin D-28 with the leather cover appeared on his first album, Elvis Presley, which was released March 23, 1956. Known as the "tonsil photo", it was cropped from a larger photograph taken during a performance on July 31, 1955 in Tampa, Florida by William V. "Red" Robertson. ↑ In 1976, the Gibson J-200 Ebony was passed on to Presley's chief personal aide and Memphis Mafia member Marty Lacker at Graceland. Lacker was one of Presley's closest friends and served as the best man at his 1967 wedding in Las Vegas. Acquired directly from Marty Lacker, this guitar was formerly on display at the Elvis-a-Rama in Las Vegas, Nevada for a number of years before being purchased in a private sale. ↑ On March 16, 2003, a Gibson Dove Custom purportedly owned by Presley was auctioned in Los Angeles with documentation indicating, "Given by Presley's aunt Delta Mae Biggs to Don Wilson, 1977". The authenticity of the guitar has been questioned because the Grover Rotomatic tuners and the two screw truss rod cover do not correspond to photos of the guitar used by Presley. The guitar sold for $29,375. 1 2 3 4 5 6 7 Roy, James V. (August 15, 2010). 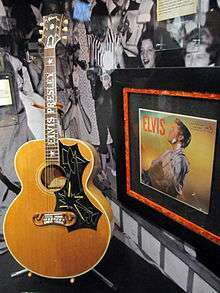 "The Performance Guitars of Elvis Presley". Scotty Moore. Retrieved January 8, 2013. 1 2 Nizza, Mike (August 16, 2007). "Elvis Is Everywhere". The New York Times. Retrieved January 9, 2013. ↑ Shelton, Robert (July 29, 1978). "How Does It Feel to be On Your Own?". Melody Maker. Retrieved January 12, 2013. ↑ Garner, Dwight (November 6, 2012). "Americans May Never Get Weary of the Boss". The New York Times. Retrieved January 12, 2013. 1 2 3 Federal Reserve Bank of Minneapolis Community Development Project. "Consumer Price Index (estimate) 1800–". Federal Reserve Bank of Minneapolis. Retrieved October 21, 2016. ↑ Roy, James V. "1940s Kay (Tupelo Hardware store) Guitar". Scotty Moore. Retrieved January 12, 2013. ↑ Roy, James V. "Elvis' Martin 000-18". Scotty Moore. Retrieved January 12, 2013. ↑ Roy, James V. "Elvis' 1942 Martin D-18". Scotty Moore. Retrieved January 12, 2013. ↑ Roy, James V. "Elvis' 1955 Martin D-28". Scotty Moore. Retrieved January 12, 2013. ↑ Roy, James V. "Elvis' 1956 Gibson J200". Scotty Moore. Retrieved January 13, 2013. ↑ Roy, James V. "1950s Isana Jazz Guitar". Scotty Moore. Retrieved January 13, 2013. ↑ Roy, James V. "Elvis' 1960 Gibson J200". Scotty Moore. Retrieved January 13, 2013. 1 2 "The Elvis Personal Guitars: Gibson J-200, 1963". Elvis.net. Retrieved November 15, 2015. ↑ Kies, Chris (April 2012). "Elvis Presley's 1975 Martin D-28". Premier Guitar. Retrieved January 9, 2013. ↑ Roy, James V. (August 15, 2010). "The Movie Guitars of Elvis Presley". Scotty Moore. Retrieved January 8, 2013. Wikimedia Commons has media related to Guitars of Elvis Presley.